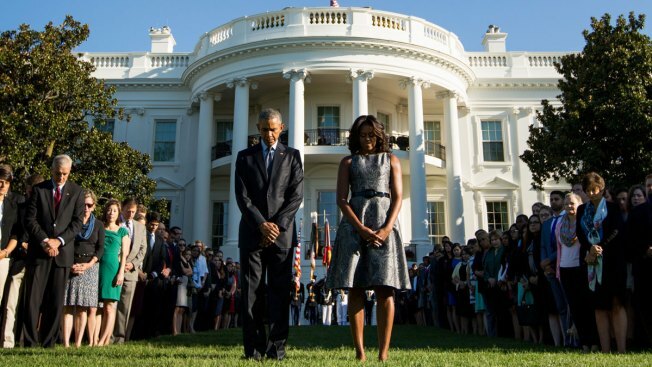 President Barack Obama, first lady Michelle Obama, and others, pause on the South Lawn of the White House in Washington, Sept. 11, 2015, as they observe a moment of silence to mark the 14th anniversary of the 9/11 attacks. Nearly a decade and a half after hijacked planes hit the World Trade Center's twin towers, the Pentagon and a field near Shanksville, Pennsylvania, the anniversary continues to be marked with observances around the country. Commemorations in the D.C. area began at dawn with the unfurling of an American flag down the side of the Pentagon. The tradition began Sept. 12, 2001, when firefighters unexpectedly got onto the building's roof and draped a large flag across the damaged building -- a quiet symbol of America's determination. The unfurling of the flag was just the first of several events scheduled at the Pentagon, which was the site of the third plane attack. A private observance ceremony will be held for survivors and families of the victims at 9:30 a.m. The event is by invitation only. 8:46 a.m.: Hijackers crash Flight 11 into the north tower. 9:03 a.m.: Hijackers crash United Airlines Flight 175 into the south tower. 9:37 a.m.: Hijackers crash American Airlines Flight 77 into the Pentagon. 9:59 a.m.: The south tower collapses. 10:03 a.m.: Passengers launch a counterattack on hijackers aboard United Airlines Flight 93. The hijackers crash the plane into an empty field near Shanksville, Pennsylvania. 10:28 a.m.: The north tower collapses. President Obama will also travel to Fort Meade, Maryland, to mark the 14th anniversary of the Sept. 11, 2001, terror attacks. White House spokesman Eric Schultz says the president will talk with service members who work every day to keep the country safe. Fort George G. Meade, a sprawling military installation between Washington and Baltimore, is home to the National Security Agency. About 11,000 military personnel and 29,000 civilian employees work on the property. Veterans will ring the bell on the campus of Marymount University to mark the moment the first plane hit the World Trade Center. School children and veterans will gather on the National Mall to take part in a day of service to help military families. If you would like to participate, head to the Reflecting Pool between 8 a.m. and 4 p.m. In honor of the lives lost in the attacks, the 5th annual "Muslims for Life" blood drive started on Capitol Hill at 9 a.m. The Alexandria Fire Department observed a moment of silence at 10 a.m. The Veterans of Alexandria held a "flash commemoration" in Market Square at noon. The event featured comments from Mayor Bill Euille. A piece of the World Trade Center was placed in front of the Kensington Volunteer Fire Department. The fire department is located on Plyers Mill Road at Connecticut Avenue.